Located in the Denver Tech Center just 30 minutes from downtown Denver, Hilton Denver Inverness is a stylish hotel that offers luxurious accommodations, award-winning cuisine, first-class amenities, including a full-service spa and fitness center, and an 18-hole championship golf course. 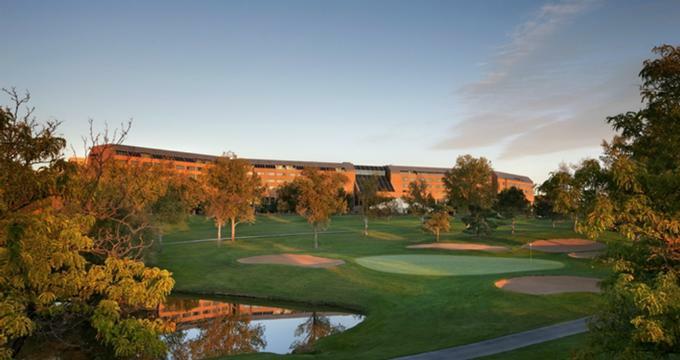 Boasting beautiful views of the golf course and pond, Hilton Denver Inverness also offers spectacular indoor and outdoor spaces for special functions and events such as weddings, receptions, and corporate gatherings. A complimentary shuttle service is provided to locations within five miles of the hotel, which is near many attractions, restaurants and other forms of entertainment in the area. Hilton Denver Inverness features beautifully appointed guest rooms and suites with contemporary décor, en-suite bathrooms, modern amenities, and beautiful views over the golf course. Room types range from Standard Guest Rooms and Luxury Suites to Executive Rooms, all of which feature king or queen-size beds with high thread count linens, designer armchairs and ottomans for relaxation, work desks, and ergonomic chairs, and en-suite bathrooms with showers, bathrobes, slippers, and Hilton bath products. Modern amenities in every room include air-conditioning, alarm clock radios with MP3 connections, LCD flat panel televisions with satellite channels and On-Demand movies and games, in-room safes, Keurig® coffee makers, mini-fridges, hairdryers, irons and ironing boards, and high-speed wireless Internet. Additional services include 24-hour housekeeping and evening turndown services. Standard Guest Rooms are 312 square feet in size and feature one king or two queen-size beds with designer Sweet Dreams® beds, and linens, en-suite bathrooms with walk-in rain showers, ergonomic workstations with outlets for electronic devices, and lovely views of the magnificent Rocky Mountains or the Inverness Golf Course. Located on the Executive Level, Executive Guest Rooms are 312 square feet in size and feature one king or two queen-size beds with designer Sweet Dreams® beds, and linens, en-suite bathrooms with walk-in rain showers, and gorgeous views of the magnificent Rocky Mountains or the Inverness Golf Course. Executive Guest Room patrons have access to the Executive Lounge, which serves a hot continental breakfast every morning and drinks and appetizers in the evening. Located on the Executive Level, Luxury Suites offer 520 square feet of space and feature designer Sweet Dreams® beds, and linens, and en-suite bathrooms with walk-in rain showers. Living areas have ergonomic workstations, wet bars with coffee makers for entertaining, and comfy seating, while private balconies boast beautiful expansive views of the Rocky Mountains or the Inverness Golf Course. The Presidential Suite is 1,150 square feet in size and offers first-class amenities and facilities for luxury living and entertaining. The Suite, which is also located on the Executive Level, features a king-size designer Sweet Dreams® bed, bedding and linens and en-suite bathrooms with glass enclosed walk-in rain shower, oversized jetted tub, as well as a spacious living area with a wet bar for entertaining, and comfy seating. Hilton Denver Inverness offers five tempting dining establishments that serve a variety of fare from light bites and pub grub to fine dining cuisine. A delicious breakfast buffet is served in the main dining room every morning, and an award-winning Champagne Sunday Brunch is served weekly on the Garden Terrace. Hilton Denver Inverness offers an array of first-class amenities and services to enhance every stay. An on-site spa and fitness center has seven treatment rooms, a Relaxation Suite, a private outdoor patio with lounging area and hot tub for the ultimate in relaxation. Services include concierge and guest activity desks, baggage storage and luggage hold, a gift shop and florist, laundry and valet service, room service, and an on-site convenience store. Outdoor and recreational activities include a golf course, driving range and putting green, a fully equipped fitness room, a jogging track, swimming pool and tennis center, and a walking track. Business services include a fully equipped business center with audiovisual equipment rentals, express mail, copying, printing and faxing services, meeting rooms for conferences, office rentals, and high-speed wireless Internet. Hilton Denver Inverness boasts over 60,000 square feet of beautifully appointed indoor and outdoor function space for up to 1,000 guests and can accommodate any type of event from weddings and receptions to conferences and business seminars. Outdoor event spaces range from tented reception sites to tranquil garden ceremonies with beautiful views of the Golf Course and the pond.